Baby Booties This item is on sale. Christmas Stocking Cuff This item is on sale. Christmas Stocking Cuff for Cat This item is on sale. 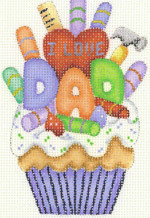 DAD CUPCAKE This item is on sale. On #18 canvas, cupcake ornament or table decoration finished with a flat base featuring miniature vanilla muffin in blue pleated container, topped with sprinkled icing, further topped with candy sticks, DAD letters, an I LOVE YOU Valentine cookie, and at the very top, a candied hammer and ruler. No doubt at all who is loved! Glass Case - 1/2 glasses This item is on sale. 18 ct., 2 5/8” X 6 ½”. From Julie Mar Designs. Halloween - Melissa Shirley Painted Wood Ornament This item is on sale. Charming little characters from Melissa Shirley Designs. Approx. 2 1/2" X 4 3/4"; painted wooden ornaments, backs are painted as the back view of the character. Each sold individually, please select character from the "color" menu. 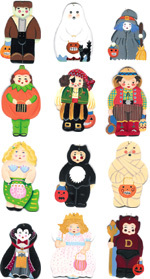 Halloween - Melissa Shirley Painted Wood Ornaments This item is on sale. Charming little characters from Melissa Shirley Designs. Approx. 3 1/4" X 4 1/4"; painted wooden ornaments, backs are painted as the back view of the character. Each sold individually, please select character from the "color" menu. Charming little characters from Melissa Shirley Designs. Approx. 2 or 2 1/2" X 3 1/2"; painted wooden ornaments, backs are painted as the back view of the character. Each sold individually, please select character from the "color" menu. Halloween - Stand up Tea Pot This item is on sale. 18 count, design area 5 1/4" X 5". By Shelly Tribbey Designs. Halloween - Stand-up This item is on sale. 18 count, design area approx. 4 1/2" X 3 1/2". By Shelly Tribbey Designs. If you elect to have us kit this for you, we'll include a stitch guide. Halloween - Witch in star shape This item is on sale. 18 count, design area 6 1/4" X 6 1/2". By Shelly Tribbey Designs. Halloween - Witch Tussie Mussie This item is on sale. 18 count, main design area 4 3/4" X 7 1/2"; overlay piece 3 3/4" X 4 3/4". Complete with Stitch Guide and stitching instructions. Design by Sandy Jenkins. 18 count, main design area 4 3/4" X 7 1/2"; overlay piece 3 3/4" X 4 3/4". Canvas only. Design by Sandy Jenkins. MOM CUPCAKE This item is on sale. On #18 canvas, cupcake ornament or tble decoration finished with a flat abase featuring miniature chocolate muffin in pink pleated container, topped with icing, further topped with candy sticks, gumdrops, MOM letters, and I LOVE YOU Valentine cookie, and at the very top, a candied stirring spoon and rolling pin. No doubt at all who is loved! Monday's Child This item is on sale. Mrs. Santa Clause Face Ornament This item is on sale. Santa Face Ornament This item is on sale. Santa Teapot - yellow This item is on sale. Scissor Case This item is on sale. 18 count, 2 5/8" X 6 1/4" and 2 1/2" X 3 3/4". Julie Mar Designs. Sign - Americans This item is on sale. 18 ct., 6 1/4" X 4". From Sally Huss. Sign - Best Friends This item is on sale. Sign - Garden This item is on sale. 14 ct., 8 1/2" X 6". From Cook. Sign - Love Golf This item is on sale. 13 ct., 8" X 6". Sign - Love You This item is on sale. 18 ct., 6 1/2" X 4". From Sally Huss. Sign - Our Son This item is on sale. Tea cup This item is on sale. 14 or 18 count, design by Denise DeRusha. 18 count, design by Denise DeRusha. 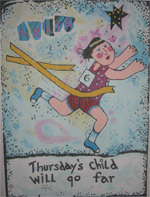 THURSDAY'S CHILD This item is on sale. See description for Sunday's and Monday's Child.